The Utility Bag from Hide & Drink accommodates your belongings and keeps you organized. With a slim and compact design, the Utility Bag is easy to pack and is ideal for traveling, bathroom drawers, or the car. Save 50% and snag one now for just $22 with promo code 50BAG. Handmade with 100% full grain leather, the Utility Bag sports durable double stitched seams and a Brooklyn-based YKK zipper for a rustic look. Store a variety of items from tools and office supplies to toiletries and shaving accessories. Available in six styles including Bourbon Brown, Swayze Suede, and Charcoal Black, a Utility Bag is just $22 after the discount. Plus, Hide & Drink offers additional home products like Pint Sleeves, Fire Mitts, and Aprons. 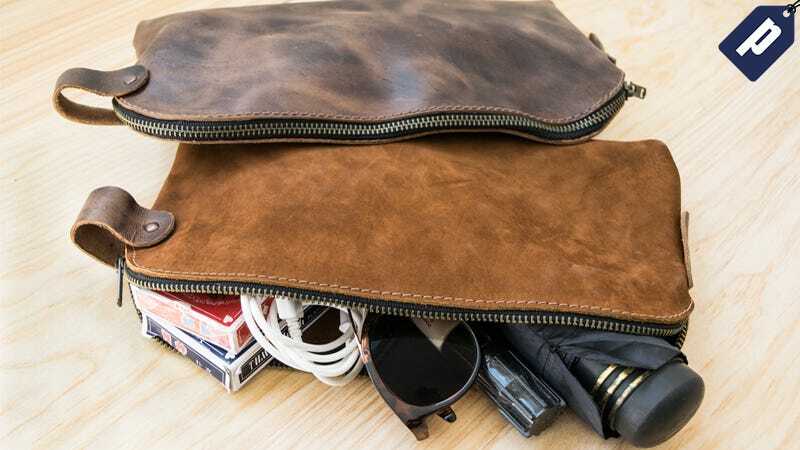 Keep your belongings organized in one place with a Utility Bag from Hide & Drink. Save 50% and grab one now for $22 with promo code 50BAG.